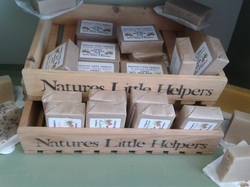 Natures Little Helpers consists of 2 beekeepers from Cardiff, South Wales (Tim Wright and Pete Shaw) who between them have over 40 years experience. They manage over 80 hives in the beautiful countryside of Lisvane, Cardiff. Their aim is to provide local honey and quality handmade cosmetics using their own honey and beeswax blended with only the finest oils and plant extracts. All of their products are made in small batches by the beekeepers to keep consistency and quality, Their products are totally natural and don't contain any artificial preservatives and are not tested on animals. Natures Little Helpers also stock Beekeeping equipment in their unit in Lisvane. They can supply everything from a complete hive to a bee suit and with their extensive knowledge of beekeeping can answer any questions you may have. They also offer experience days for people interested in leaning about beekeeping. This lovely honey comes straight from the hive, it is filtered and then put into the jar. It is not heat treated so keeping all its natural goodness for you to enjoy. We normally stock this honey it 2 different sizes 350g and 227g and it doesn't stay long on our shelves! Natures Little Helper's soap is made by the cold process soap-making method to ensure that all the natural glycerines are left in the bar to moisturise the skin. These bars contain their own honey with Olive oil, Coconut oil, Palm oil, Shea butter and a range of essential oils to make a soap that smells wonderful and produces a luxurious lather.